iPhone, iPad, and iPod touch are registered trademarks of Apple Inc. Android is a trademark of Google, Inc.
of your wireless signal to significantly outperform 802.11g devices. network traffic so your video streaming, gaming, and VoIP calls run smoother over both your wired and wireless network. displayed on the mydlinkв„ў Lite app вЂ“ which is great for parents. activities will be displayed right on your mydlinkв„ў Lite app or browser. wireless networking at speeds 14x faster than 802.11g. it can connect with existing 802.11g PCI, USB, and Cardbus adapters. Using an Ethernet cable, connect your broadband modem to this port. Connect a USB flash drive to share content throughout your network. Press to start the WPS process. The Internet LED will start to blink. Connect 10/100/1000 Ethernet devices such as computers, switches, storage (NAS) devices and game consoles. the WPS process. The light will blink orange during boot up. the router cannot connect to the Internet. Broadjump, or Enternet 300 from your computer or you will not be able to connect to the Internet. the number of walls or ceilings is minimized. 1.Turn off and unplug your cable or DSL broadband modem. This is required. work area for better wireless coverage. 3.Unplug the Ethernet cable from your modem (or existing router if upgrading) that is connected to your computer. Plug it into the LAN port labeled 1 on the back of your router. The router is now connected to your computer. INTERNET on the back of the router. Plug the other end of this cable into the Ethernet port on your modem. already. Try opening a web browser and enter a web site. If you connect, you are finished with your Internet setup. and wireless settings. If you did not connect to the Internet, use the D-Link Setup Wizard (refer to page 14). 3.Click on Advanced and then click Advanced Network. Uncheck the Enable UPnP checkbox. Click Save Settings to continue. 4.Click Setup and then click Network Settings. Uncheck the Enable DHCP Server checkbox. Click Save Settings to continue. вЂў D-Link Setup Wizard - This wizard will launch when you log into the router for the first time. Refer to page 14.
вЂў Manual Setup - Log into the router and manually configure your router (advanced users only). Refer to page 22.
to access the configuration utility, please refer to page 22.
your ISP information such as username and password. to the Internet port and then click Try Again. and password and click Next to continue. software is no longer needed and will not work through a router. settings supplied by your ISP. Click Next to continue. Create a Wi-Fi network name (SSID) using up to 32 characters. for added security. Click Next to continue. you do not want to create a bookmark. browser you are using) to create a bookmark. need to create one. Click Next to continue. If you do not want to register at this time, click Cancel. password. Click Login to register your router. Once your account information is entered, click Login. (iOS 3.0 or higher), Android device (1.6 or higher). PC and Mac users can use the mydlink portal at http://mydlink.com. Once your app is installed, you may now configure your router. supplied info card. Select and then enter your Wi-Fi password. the Setup > Storage page (refer to page 53) for this app to work properly. 1. Insert your USB flash drive into DIR-636L. from your USB flash drive. http://dlinkrouter in the address bar. connection manually and continue to the next page. intended to go and saving you valuable time. functionality and operation of the Advanced DNS service or its features. Routing Connectivity: through-put of the WAN-LAN connectivity of the router. Routing Connectivity: of the WAN-LAN connectivity of the router. blank if you are not sure. DNS Server: from your ISP. Leave at 0.0.0.0 if you did not specifically receive these from your ISP. you where you intended to go and saving you valuable time. and operation of the Advanced DNS service or its features. Gigabit Routing the WAN-LAN connectivity of the router. and DNS server addresses. In most cases, select Dynamic. DNS Enter the Primary and Secondary DNS Server Addresses (Static PPPoE only). My Internet Select PPTP (Username/Password) from the drop-down menu. Enable True Check to enable true Gigabit routing. This will increase the throughGigabit Routing put of the WAN-LAN connectivity of the router. Password: Enter your PPTP password and then retype the password in the next box. My Internet Select L2TP (Username/Password) from the drop-down menu. Gigabit Routing through-put of the WAN-LAN connectivity of the router. Password: Enter your L2TP password and then retype the password in the next box. DNS Servers: Enter the Primary and Secondary DNS Server Addresses (Static L2TP only). device using Wi-Fi Protected Setup (WPS) and refer to page 44. Click New Schedule to create a schedule. Name: network. Create a name for your wireless network using up to 32 characters. The SSID is case-sensitive. 802.11b Only - Select only if all of your wireless clients are 802.11b. 802.11g Only - Select only if all of your wireless clients are 802.11g. Mixed 802.11g and 802.11b - Select if you are using both 802.11g and 802.11b wireless clients. Mixed 802.11n and 802.11g - Select if you are using both 802.11n and 802.11g wireless clients. Mixed 802.11n, 11g, and 11b - Select if you are using a mix of 802.11n, 802.11g, and 802.11b wireless clients. Enable Auto The Auto Channel Scan setting can be selected to allow the DIR-636L to choose the channel with the least amount of interference. 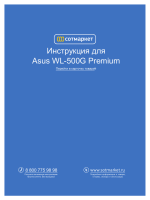 Wireless Security: Refer to the next page for more information regarding wireless security. WPA (Wi-Fi Protected Access), is a Wi-Fi standard that was designed to improve the security features of WEP (Wired Equivalent Privacy). based on 802.11i and uses Advanced Encryption Standard (AES) instead of TKIP. network users can access the network. key encryption system to ensure that only authorized network users can access the network. a passphrase for your security password. Click Next to continue. Setup) and then click Next. Skip to the next page. you did on the router. and then click Wireless Settings on the left side. 2.Next to Security Mode, select WPA-Enterprise. 11. Click Advanced to enter settings for a secondary RADIUS Server. Device Name: Enter a name for the router. WINS IP Enter your WINS Server IP address(es). address only to that computer or device. MAC Address: are currently on, click this button to populate the fields. at the top to activate your reservations. Enable: Check to enable the reservation. Edit: Click the edit icon to make changes to the reservation entry. Delete: Click to remove the reservation from the list. to be allowed to access these files. Storage Remote have to type HTTP in the URL. Number of Displays the USB device plugged into the router. want to assign the Access Path to. can use the Web-based IPv6 Internet Connection Setup Wizard, or you can manually configure the connection. guide you through a few simple steps to get your network up and running. On this page, the user can configure the IPv6 Connection type using the IPv6 Internet Connection Setup Wizard. and return to the main page. the appropriate parameters for the connection type found. know your user name, please contact your ISP. know your password, please contact your ISP. Service Name: Enter the service name for this connection here. Address: communicating with neighboring nodes on the same link. with each other on the LAN side. Secondary IPv6 Enter the WAN secondary DNS Server address used here. After selecting the Tunneling Connection (6rd) option, the user can configure the IPv6 6rd connection settings. Assigned IPv6 Prefix: Displays the IPv6 assigned prefix value here. 6rd Border Relay IPv4 Enter the 6rd border relay IPv4 address used here. The IPv6 Internet Connection Setup Wizard is complete. configure your IPv6 setting from your ISP. Use the following DNS Address. Enable Autoconfiguration: Check to enable the Autoconfiguration feature. << to populate the fields. Protocol Type: Select TCP, UDP, or Both from the drop-down menu. Advanced > Inbound Filter page. is determined by your ISP. ISPвЂ™s often speed as a download/upload pair. For example, 1.5Mbits/284Kbits. Using this example, you would enter 284. Alternatively you can test your uplink speed with a service such as speedtest.net. and specific QoS Engine Rules will not be required. the rule with the highest priority will be used. Name: Create a name for the rule that is meaningful to you. Priority: The priority of the message flow is entered here -- 1 receives the highest priority (most urgent) and 255 receives the lowest priority (least urgent). Protocol: The protocol used by the messages. Local IP Range: The rule applies to a flow of messages whose LAN-side IP address falls within the range set here. Local Port Range: The rule applies to a flow of messages whose LAN-side port number is within the range set here. Remote IP Range: The rule applies to a flow of messages whose WAN-side IP address falls within the range set here. Remote Port Range: The rule applies to a flow of messages whose WAN-side port number is within the range set here. to the Networking Basics section in this manual. click << to copy that MAC Address. Web Filter under the Access Control section. DMZ machine does not change. PPTP: Allows multiple machines on the LAN to connect to their corporate network using PPTP protocol. are some of the common applications using this protocol. having trouble making VoIP calls, try turning this ALG off. Name: Enter a name for your route. if you are in a country that requires it. less reliable and may create higher data loss. side of the router will be disabled. Method: network. This will not affect the Push-Button method. change or reset the PIN. Current PIN: Shows the current PIN. the user interface of the wireless client. 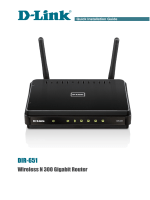 Add Wireless Click to start the wizard and skip to page 44.
button on your wireless client to automatically connect without logging into the router. Refer to page 109 for more information. Filters section for more information. 100Mbps, 1000Mbps, or Auto (recommended). Multicast Streams: the router from the Internet (IPv4). Multicast Streams: the router from the Internet (IPv6). will be separate from your main wireless network. You may configure different zones for the 2.4GHz wireless band. section or click Add New. The DIR-636LвЂ™s IPv6 Firewall feature allows you to configure which kind of IPv6 traffic is allowed to pass through the device. The DIR-636LвЂ™s IPv6 Firewall functions in a similar way to the IP Filters feature. Configure IPv6 Select an action from the drop-down menu. IP Address Range: Enter the source IPv6 address range in the adjacent IP Address Range field. Dest: Use the Dest drop-down menu to specify the interface that connects to the destination IP addresses of the firewall rule. length of the packets that will take this route. Metric: Enter the metric value for this rule here. change the settings (you can only view them). System Name: Enter a name for your router. unauthorized users from gaining access to your routerвЂ™s network settings. and 8080 is the port used for the Web Management interface. to access the router remotely. remove the rule. Details will display the current status. Time: Displays the current date and time of the router. computer you are currently on. receiving an IP address from the router via DHCP). file or firmware upgrade notification via email. To Email Address: Enter the email address where you want the email sent. SMTP Server Address: Enter the SMTP server address for sending email. SMTP Server Port: Enter the SMTP port used on the server. Enable Authentication: Check this box if your SMTP server requires authentication. account when the log is full. go to Tools > Schedules. Real-Time Browsing Check to enable browsing history (for mydlink Lite app). device (for mydlink Lite app). Event Trigger: Check to enable event triggering (for mydlink Lite app). default settings. Restoring the unit to the factory default settings will erase all settings, including any rules that youвЂ™ve created. those settings to the router. Settings: time the router was shipped from the factory. Reboot Device: Click to reboot the router. Address: menu or enter the DDNS server address. Password or Enter the Password or key for your DDNS account. Timeout: Enter a timeout time (in hours). wish to Ping and click Ping. IPv6 Ping Test: Enter the IPv6 address that you wish to Ping and click Ping. This page displays the current information for the DIR-636L. It will display the LAN, WAN (Internet), and Wireless information. If your Internet connection is set up for a Dynamic IP address then a Release button and a Renew button will be displayed. Use Release to disconnect from your ISP and use Renew to connect to your ISP. to drop the PPPoE connection and use Connect to establish the PPPoE connection. First Page: Click to go to the first page. Last Page: Click to go to the last page. Previous: Click to go back one page. the WAN, LAN ports and the wireless segment. The traffic counter will reset if the device is rebooted. This page will display your current routing table. Step 1 - Press the WPS button on the DIR-636L for about 1 second. The Internet LED on the front will start to blink. like to connect to and click the Connect button. the WPS button on the router. 1.Click the Start button and select Computer from the Start menu. 2.Click Network on the left side. similar to the Windows VistaВ® utility as seen below. corner next to the time). Select Connect to a network. on a network (displayed using the SSID) and click the Connect button. section in this manual for more information. your router and click Connect. connecting to a wireless network. Most utilities will have a вЂњsite surveyвЂќ option similar to the WindowsВ® XP utility as seen below. corner next to the time). Select View Available Wireless Networks. of screen). Select View Available Wireless Networks. Wi-Fi password and click Connect. Wi-Fi password must be exactly the same as on the wireless router. proper value, the actual MTU size would be 1480, which is the optimum for the network weвЂ™re working with (1452+28=1480). adapters on each computer, such as two or more DIR-636L wireless network Cardbus adapters. of network traffic, building materials and construction, and network overhead, lower actual data throughput rate. Environmental factors will adversely affect wireless signal range.